Have a mysterious and calming picture of pine trees. Pines are slender and at one look, it would seem they would easily break. But they endure strong storms by swaying with the harsh winds and ultimately survive. Forests have been part of nature even before people existed. This goes back since prehistoric times, where ancient living beings used to call these places habitat. For them, it’s a sanctuary. It’s a symbol of life, serenity, rejuvenation and a lot more. Its meaning has been widen as time goes by. And these meanings have been carried throughout the modern times. 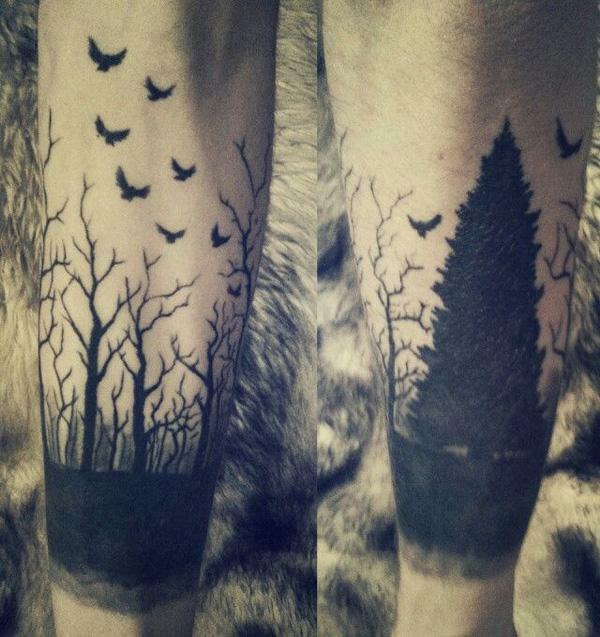 Forests continue to symbolize many things even in tattoos. Forests are abundant in life and mysteries and the same goes with symbolism. It could mean many different things at once or it could mean completely the opposite. It’s in the power of the artist and the one who will get a tattoo to decide what it would mean. Even the type of trees would indicate a different meaning to another kind of tree. You can combine them all based on what your tattoo’s message is. Or you can add certain elements that will make it much more interesting too look at and have a deeper sense of meaning. Forests and trees are so much like our life. We get to experience cycles in the form of challenges and even happy memories. It could be closely comparable to the seasons that trees have to go through. There’s always the calm and peaceful autumn, then the harsh and dead winter, the rebirth and new hope of spring and the preciousness and happiness of summer. 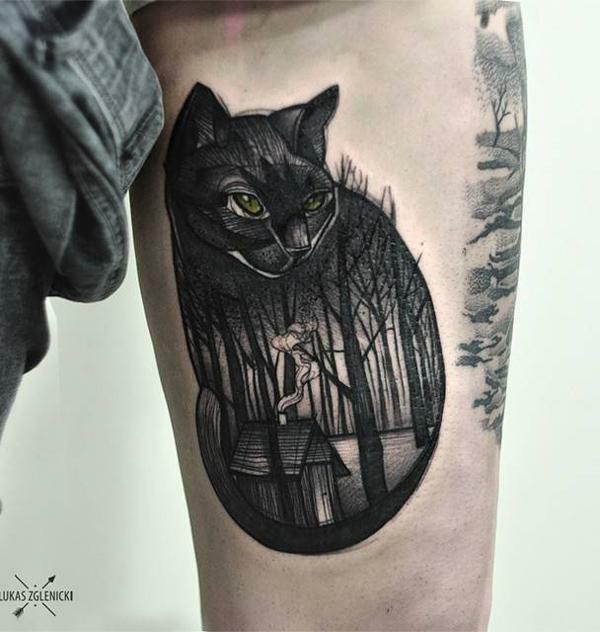 The season could also add or change the meaning of your tattoo so you can play with the designs if you wish to get a good story behind your tattoo. But apart from the variety of meaning you can get from a single picture, it also has this calming effect the moment you set your eyes on it. As if by magic, it can transport you to that place and you can have your own soul-searching. 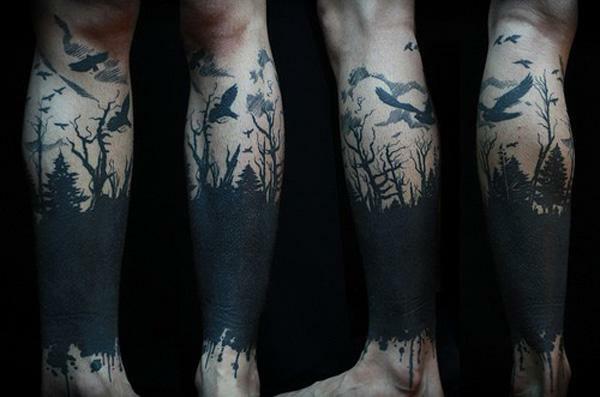 Of course there are designs that are “darker” and can leave you feeling terrified. But the thing is it’s that kind of design that somehow makes you FEEL. There’s always a feeling accompanied by looking at it; whether you know the story behind or not. If you’re already convinced but have no idea which design is good, you’re in the right place. If you’re not yet convinced but definitely interested, you’re still in the right place. 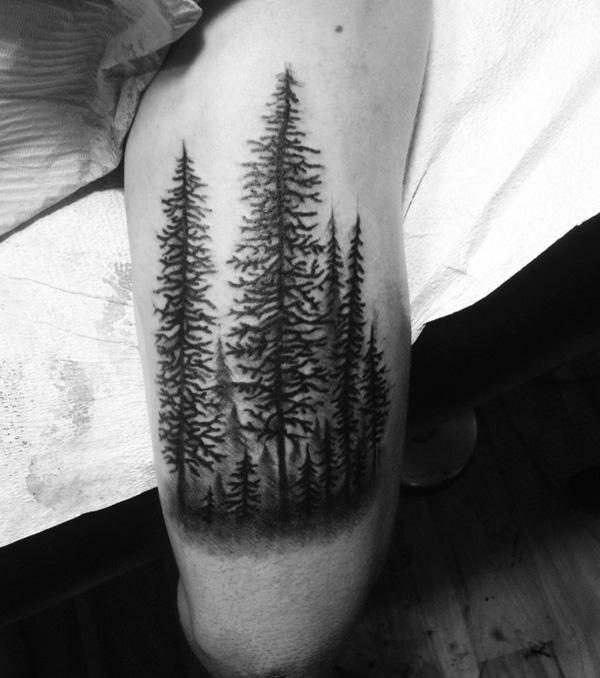 Here, you’ll get some good ideas for your soon-to-be forest tattoo. Bare trees are often deemed eerie and it is. But it’s also beautiful in its own way. In meaning, it could signify your vulnerability as a human being. Here is an image of a home in the middle of a forest. It’s serene and it could be your way of showing how you are very much at peace with your life and with your family. 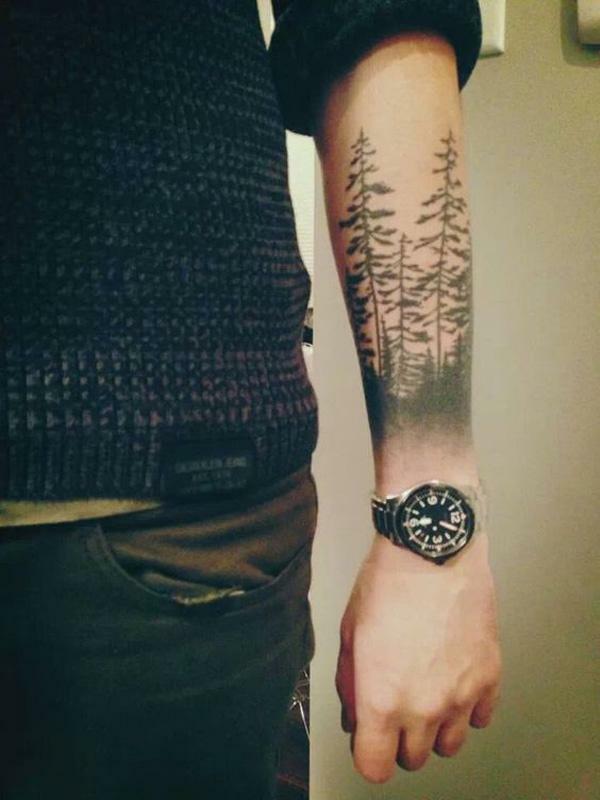 This image of a forest could be menacing. But it’s very abundant with growing trees and with that, it could also be filled with life. In addition, its 3D effect makes it look much better. 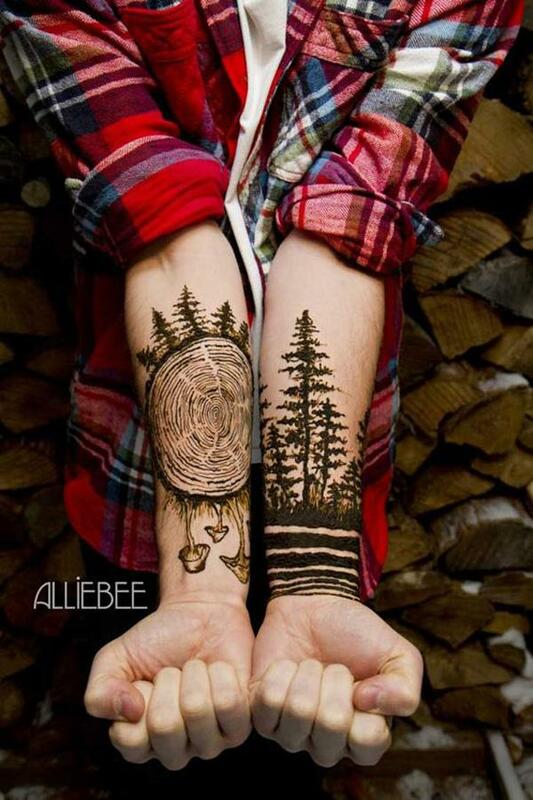 Girls could also go with forest tattoos and here’s an enchanting and unique way to get it done. 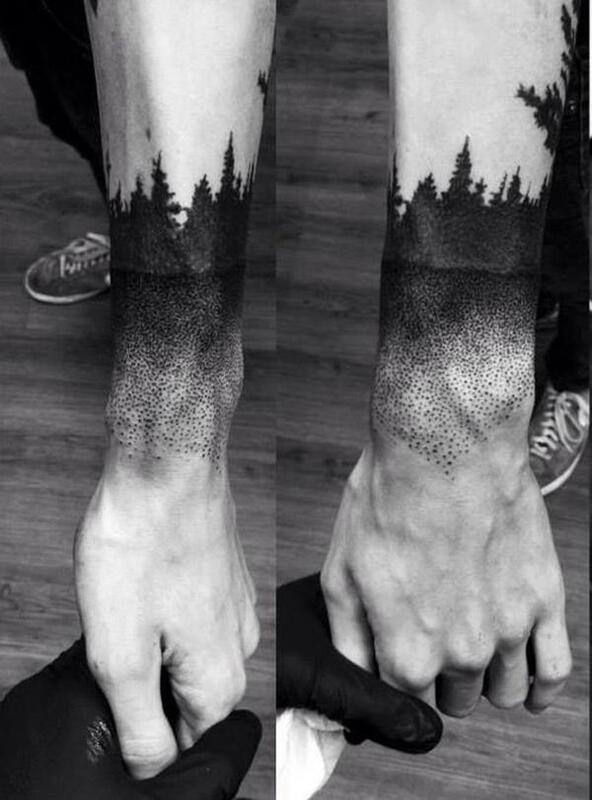 It’s a small landscape of a forest at night designed like an armband. 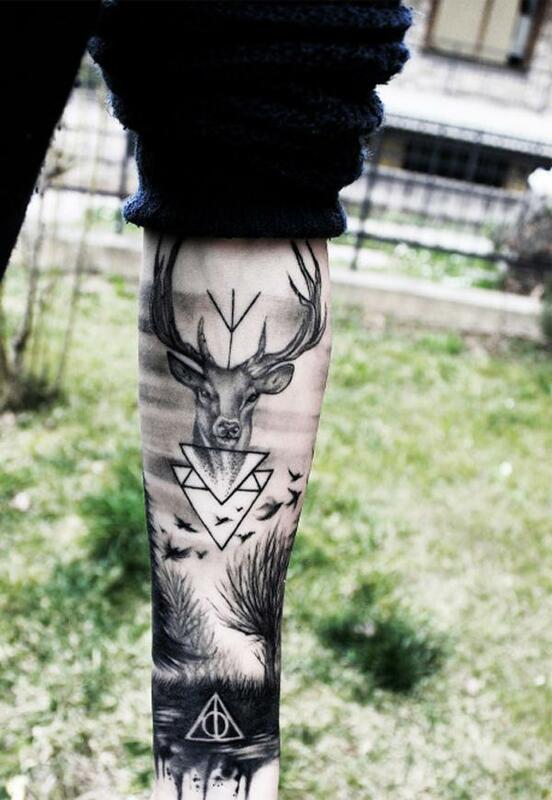 Deers, just like trees, could also be a symbol for rebirth. 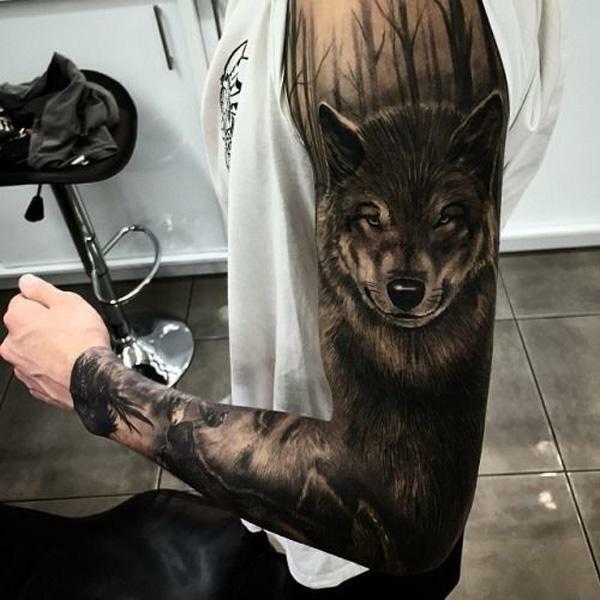 Plus this is just a magnificent picture and design worthy to be embedded in your skin for all time. Sun is often regarded as a symbol of masculinity while the moon symbolizes femininity. If you’re a guy, this could signify the woman/women in your life. You could be the bare tree starting to grow leaves and growing. It just means you grow with their help. 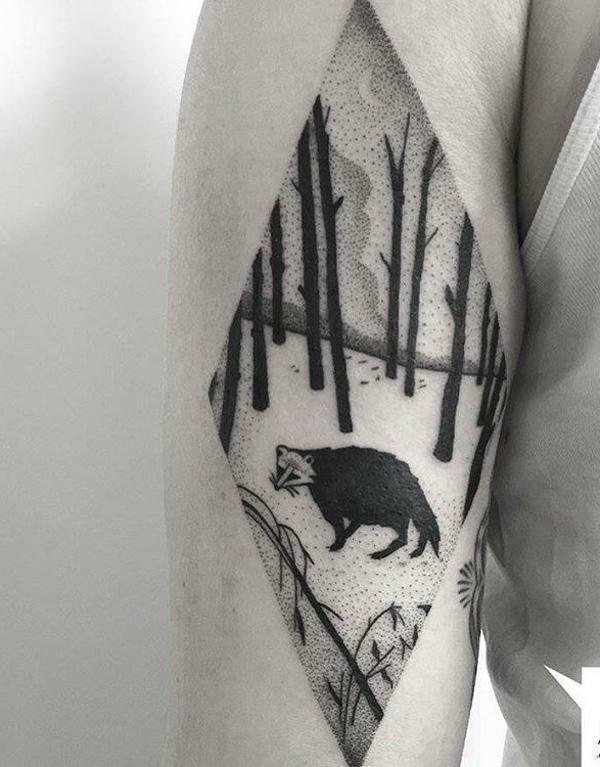 Another forest tattoo design for women. 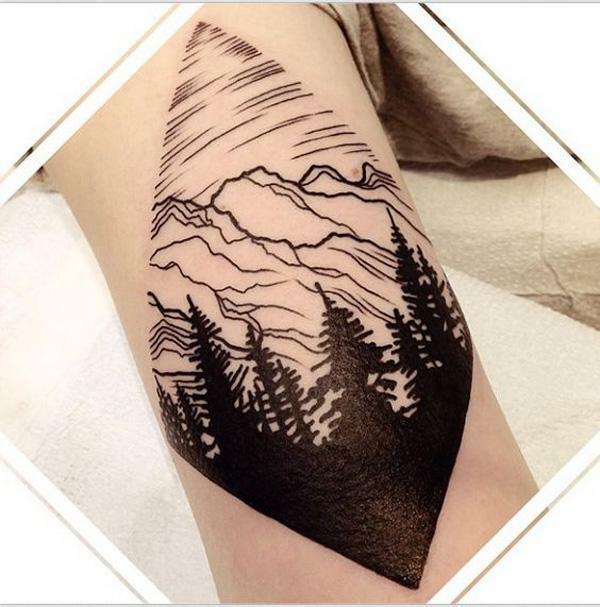 This time around, it has a view of the mountains. It could simply mean a place they wanted to remember. Or it could mean a journey they will never forget. 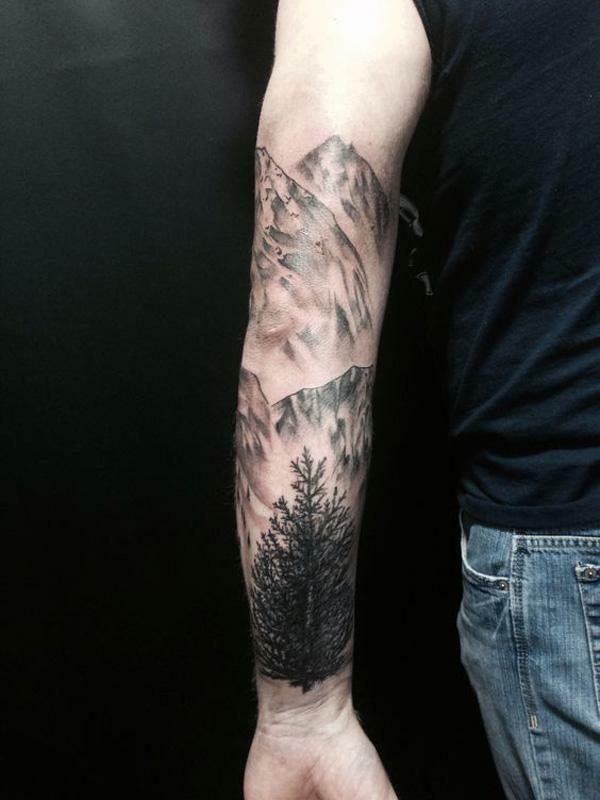 Here’s another forest tattoo with a rocky mountain. 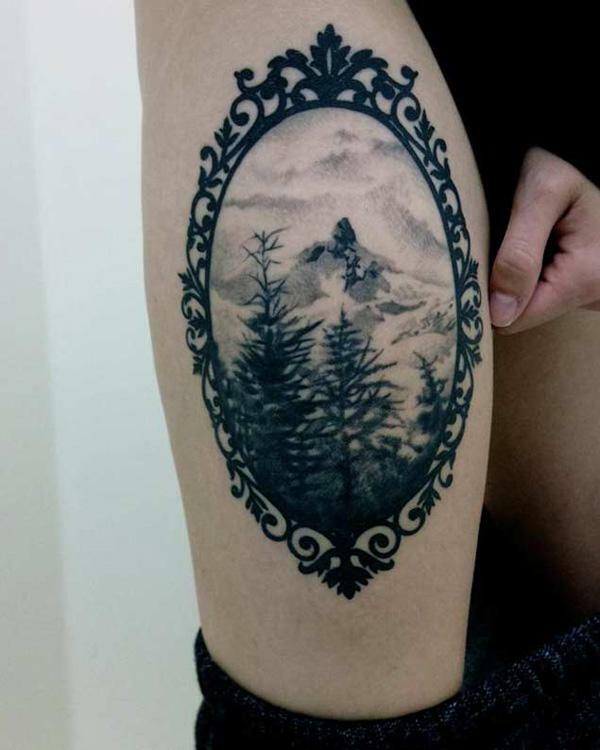 It’s the usual set up for forests and mountains and it could make you feel closer to nature even if it’s simply a tattoo. 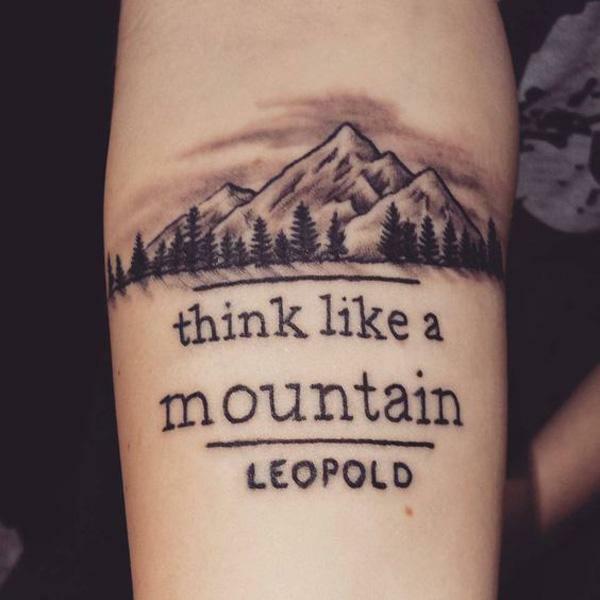 This mountain and forest tattoo accompanied by a famous term by Aldo Leopold could mean the same thing: learning to appreciate the interconnectedness of every element in an ecosystem. Majestic and magical. 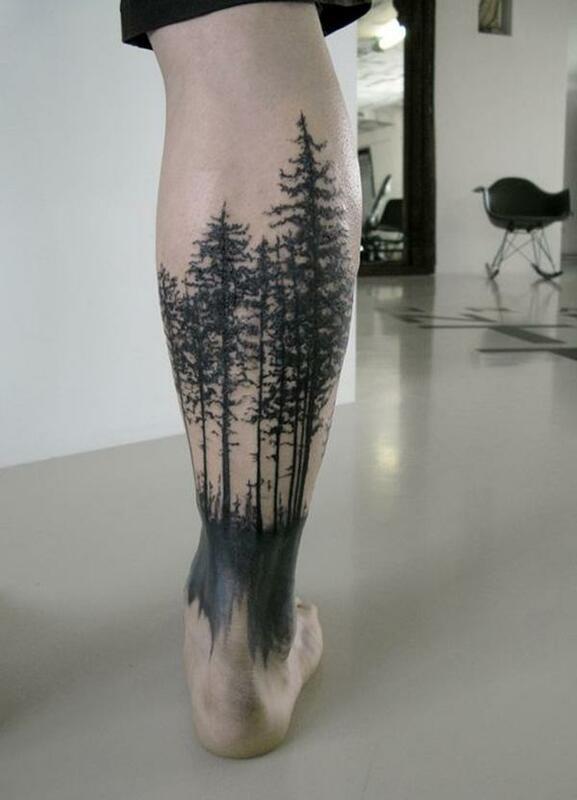 Definitely what a forest tattoo IS and SHOULD BE. 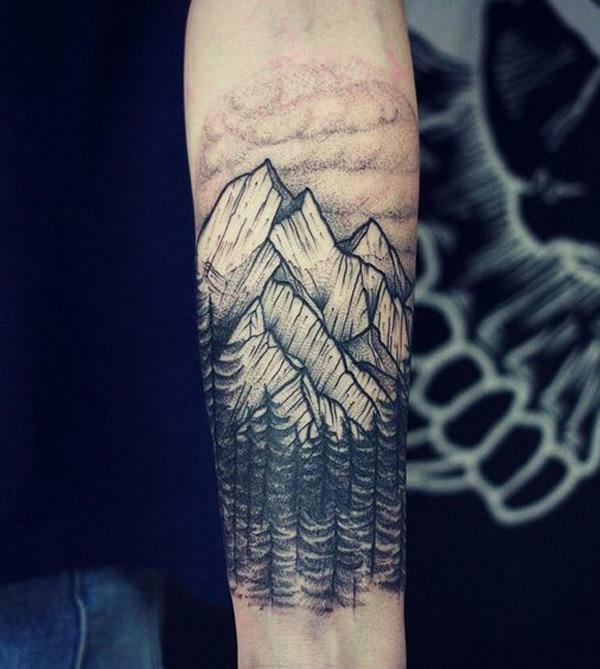 Rocky mountains could be hard to conquer; forests could be scary. But you can because you are also strong and can overcome challenges. 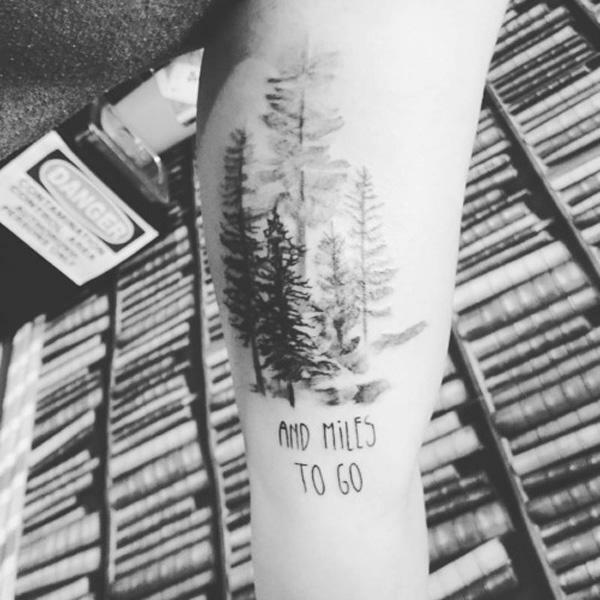 This tattoo could be your daily reminder. 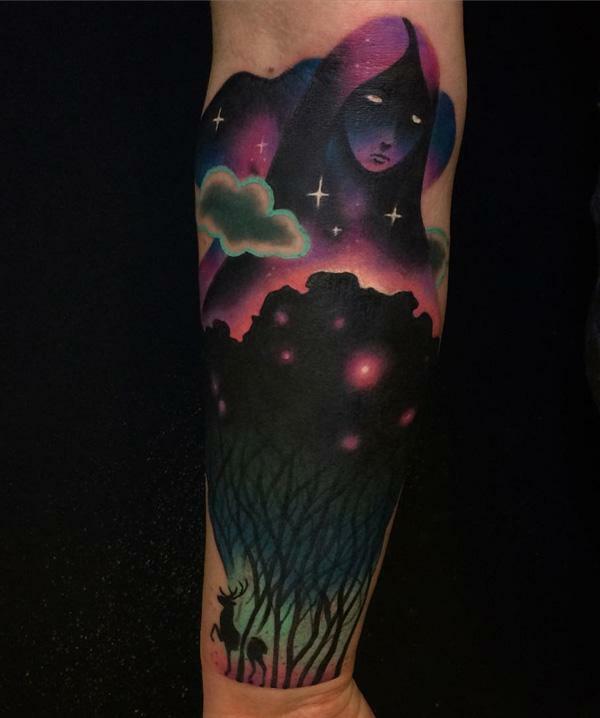 This beautiful design shows a girl looking at the night sky with a forest in the distance. It could hold your story or you can simply let other people create their versions of this wonder. Evergreens remains strong no matter what they have to go through: snow, rain or sun. It’s a subtle tattoo but it has such a powerful message. 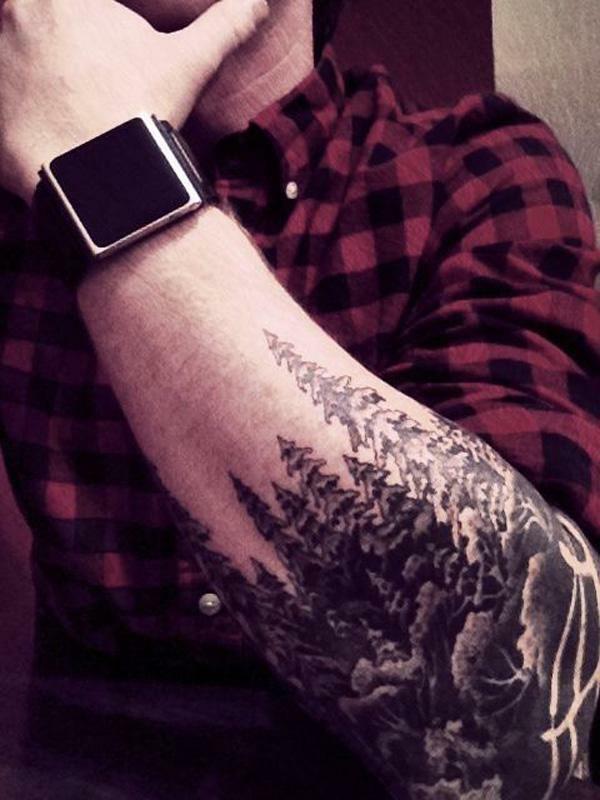 The thing about tree tattoos is you can wear them anywhere in your body. It could be big or small. 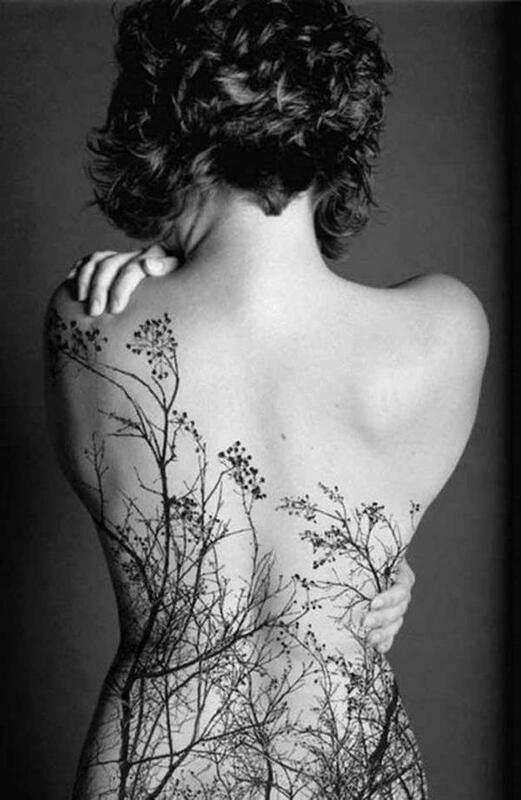 But no matter what you choose, it would still look awesome; even if it covers half of your back like this. A mixture of bare and healthy trees could tell you’re both strong but vulnerable. 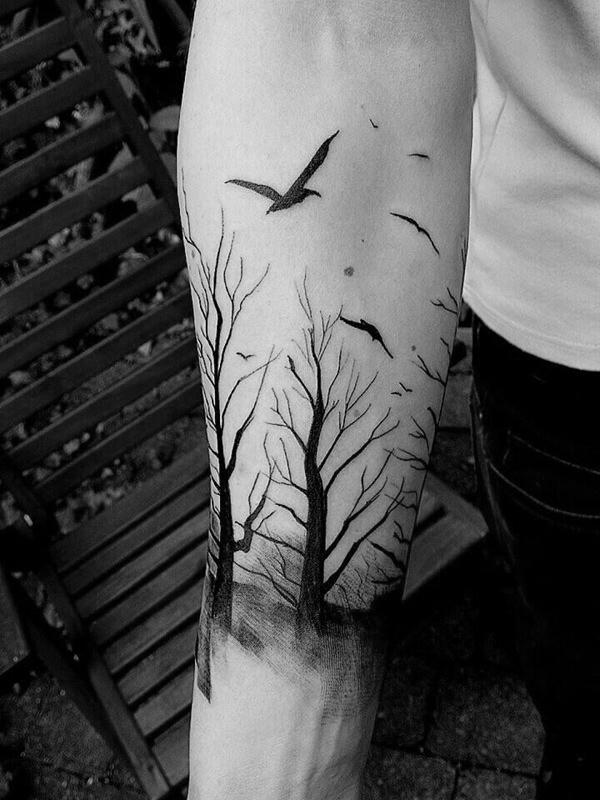 The birds are seen as a form of freedom. In general, the picture could tell how you are now free of anxiety because you accept every part of you. 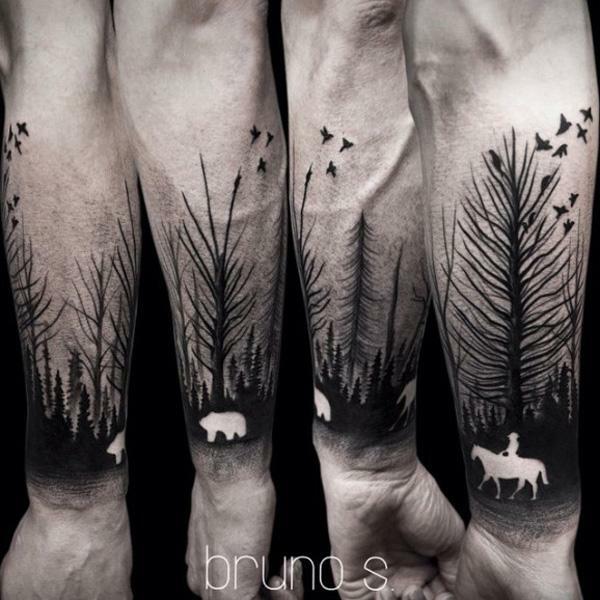 This hauntingly beautiful tattoo shows the silhoutte of trees and then that of an animal and a man riding a horse. 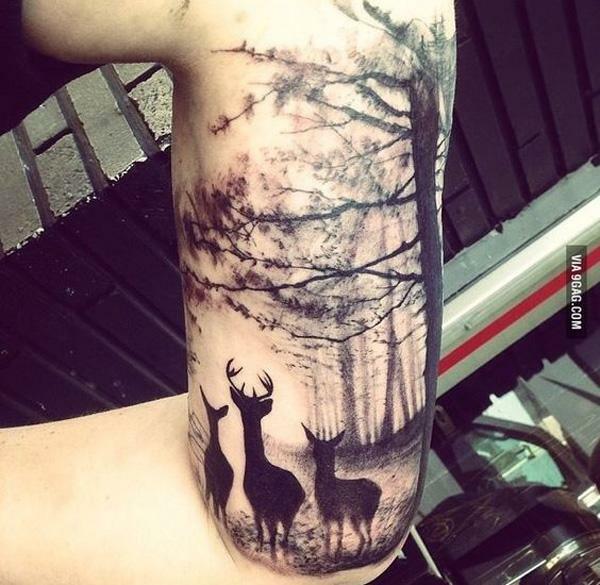 This is one of those tattoos you can get not because it holds so much meaning but because it just looks amazing. At first you might think of it as very unique but fashionable stockings. See? 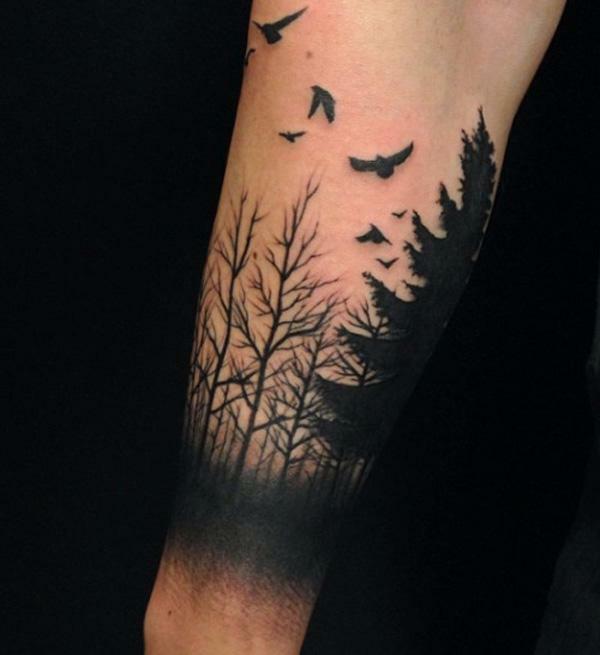 Tattoos could be part of your fashion statement. From a living forest to an eerie dead one. Even in the stark difference, both designs are calming and can show spirituality. A striving tree in the midst of barren ones. It can show struggles in life but you can ultimately survive all of it. 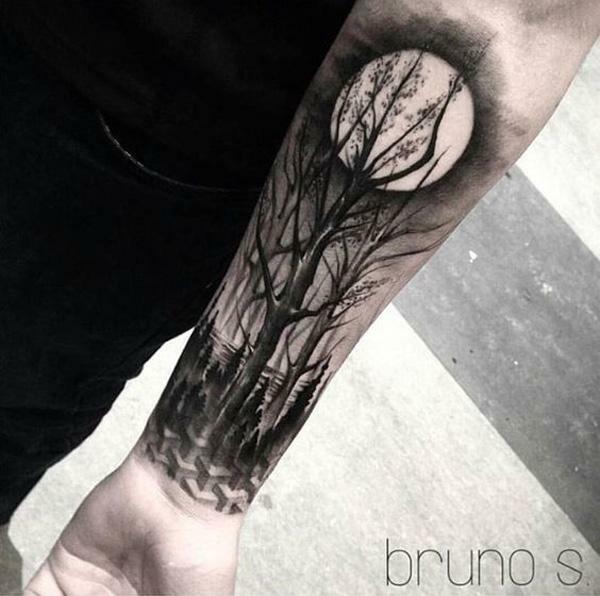 It’s also one big picture around the arm so it’s also a beautiful design in general. Dark and menacing at it may seem, bare trees shows someone’s vulnerability. But the hazy silhouette of healthy trees could show how you are actually strong by accepting your flaws. 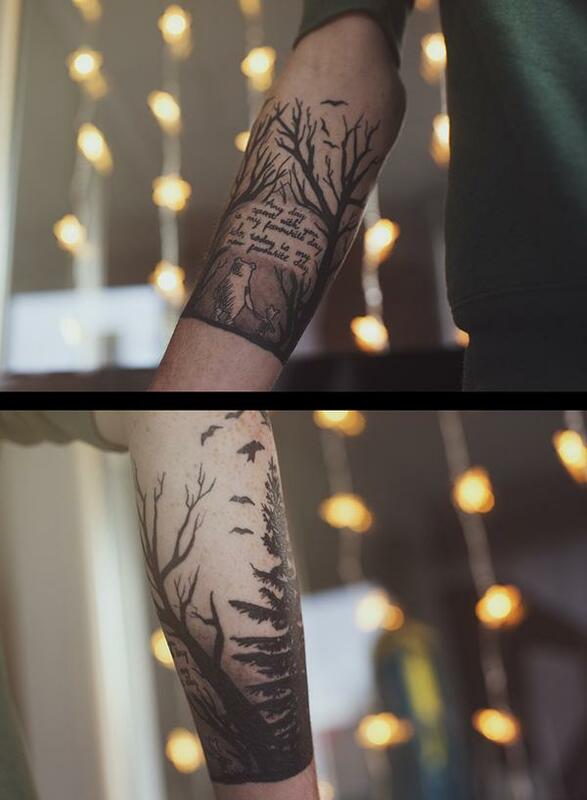 What’s beautiful with forest tattoos is that you can make a complete picture but it still wouldn’t look messy like some designs. 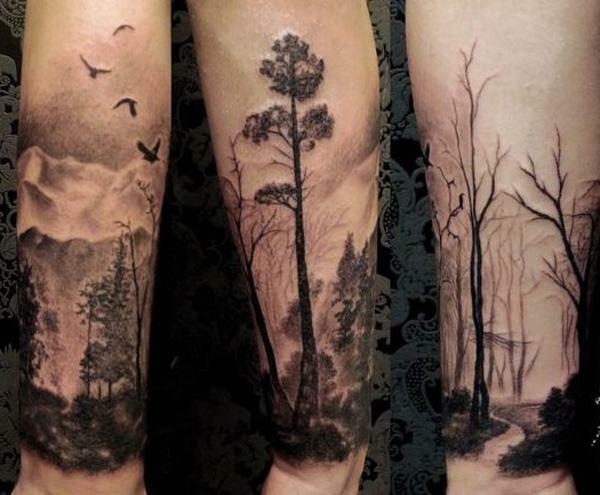 Forest tattoos are often great to look at since you know somewhere, there is actually a place that looks like it. 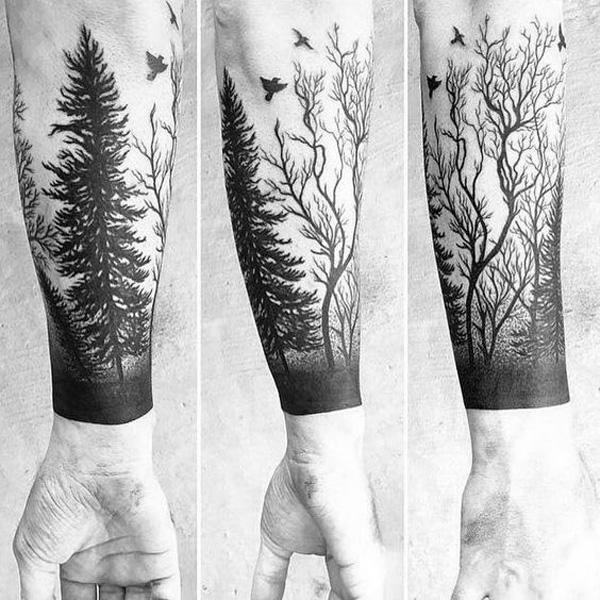 You can make a design of a forest you’ve been before. Enchanting. This forest was marvelously done to copy a real place close to perfection. Trees are one of Earth’s elements that stay strong no matter what happens. Trees could symbolize you and your journey; that no matter what comes along, you are still standing and walking. Tree rings are said to show how old a tree is. So showing tree rings that indicates an older tree, it could either depict you as an old soul or that you are strong enough to grow. But it could definitely depend on your own story. Forests; whether with live abundant trees or bare ones, are usually hard to do since there are a lot of details that goes on in the design. 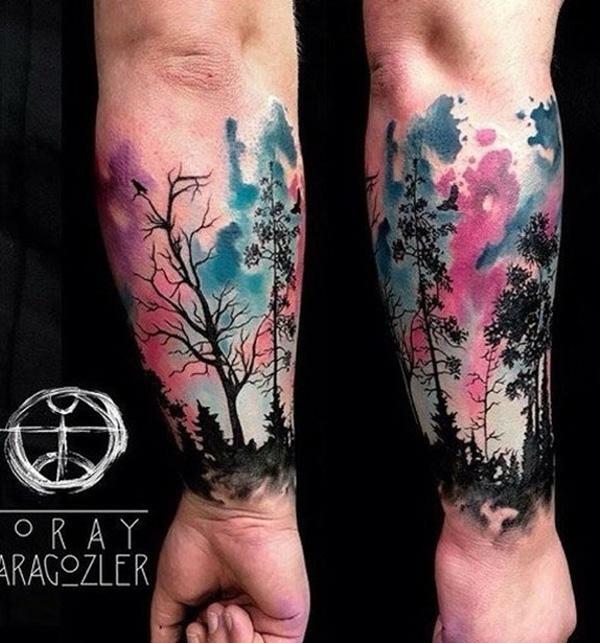 However if you do find yourself a good tattoo artist, the end results would be amazing like in here. 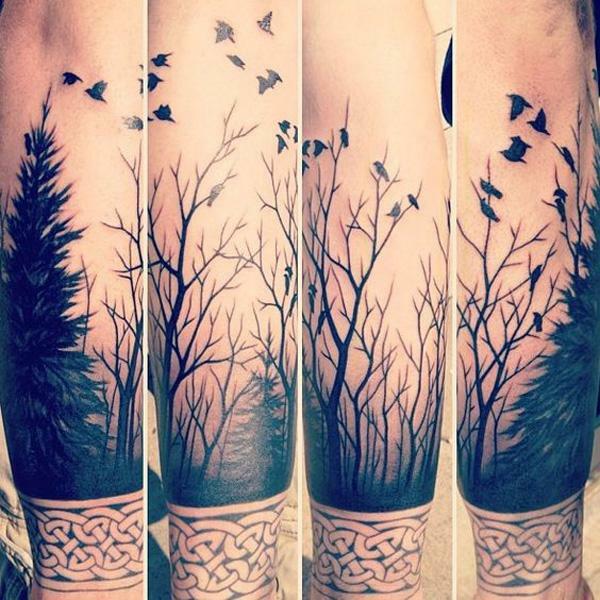 These types of tattoos could be placed in any part of your body. It’s usually best place in the arms or in the legs as you can create an infinite picture. Who said Winnie the Pooh is just for kids? Having it as a tattoo could of course indicate your inner child or perhaps remembering the lessons you’ve learned from this literary classic. 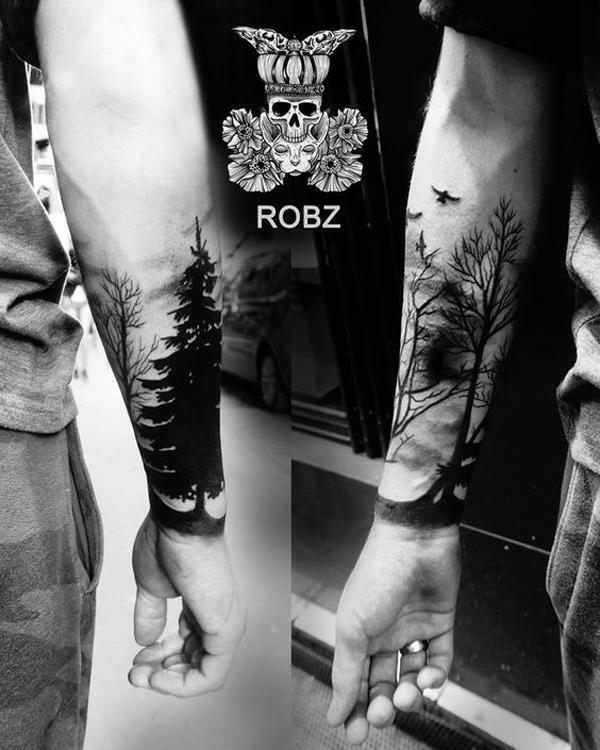 Another place you can put a forest tattoo is around your forearm which can let you showcase the masterpiece you have. Learn to be free. Even if the world is sometimes hostile, it can still be very beautiful. 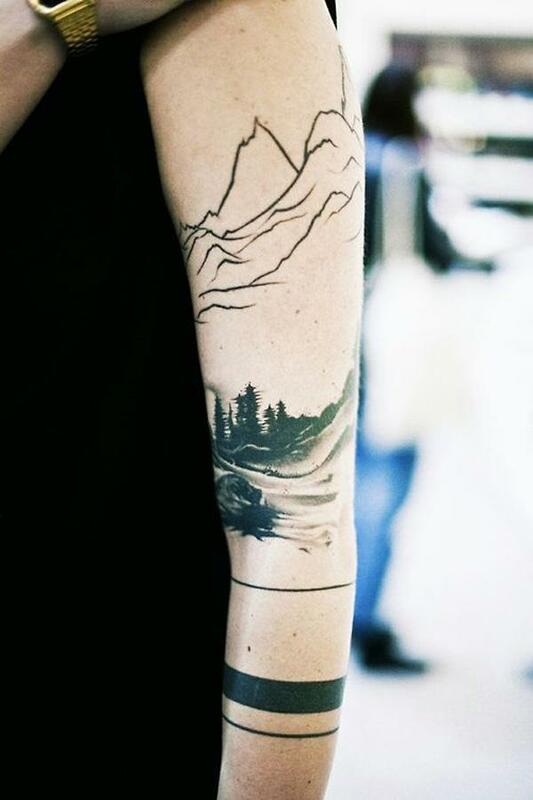 Stand tall and proud of your achievements just like your tattoo. It’s really simple which makes it a tattoo must-have. 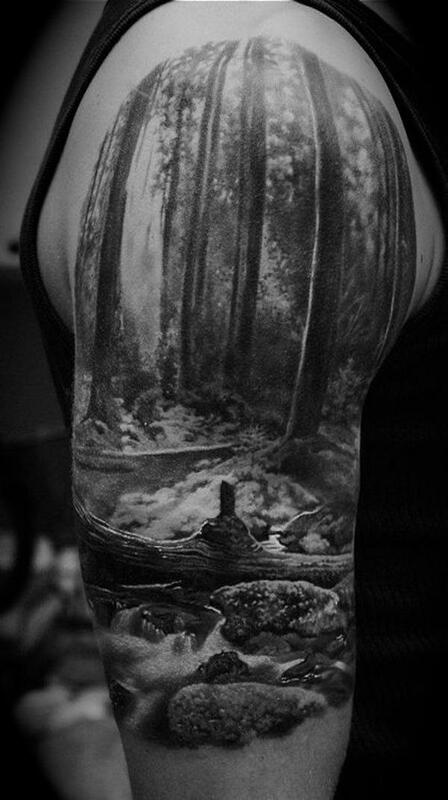 This abstract forest inside a tattoo design is unique and what you should get if you’re looking for a tattoo design that is fun and creative. If you’re quite familiar with the symbol below, it could be the Deathly Hallows symbol from Harry Potter. If you know that, then I’m assuming you also know that a deer has so much value for a couple of characters in the story. Always. The fox commonly signifies cleverness and strong mental health. So if that’s what you wanted to show, you can choose this cool fox in the forest design. 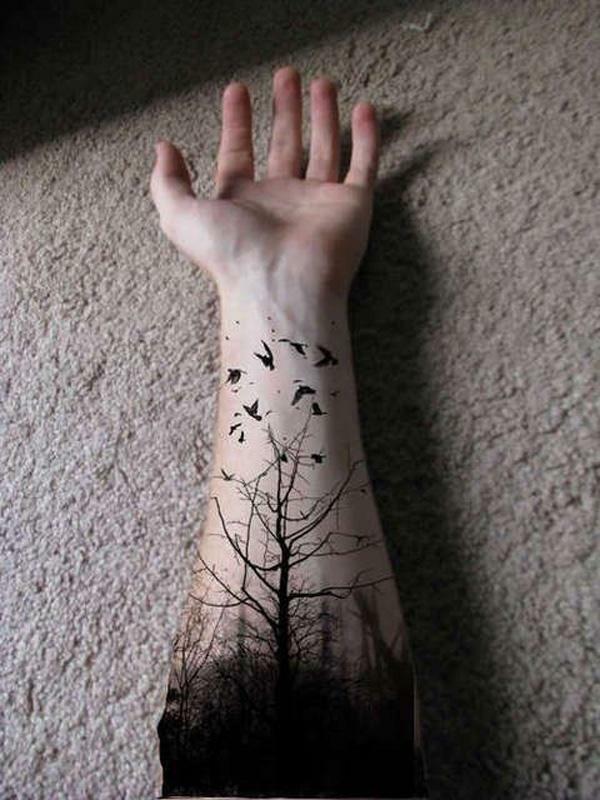 As said, you can place your tattoo anywhere in your body. 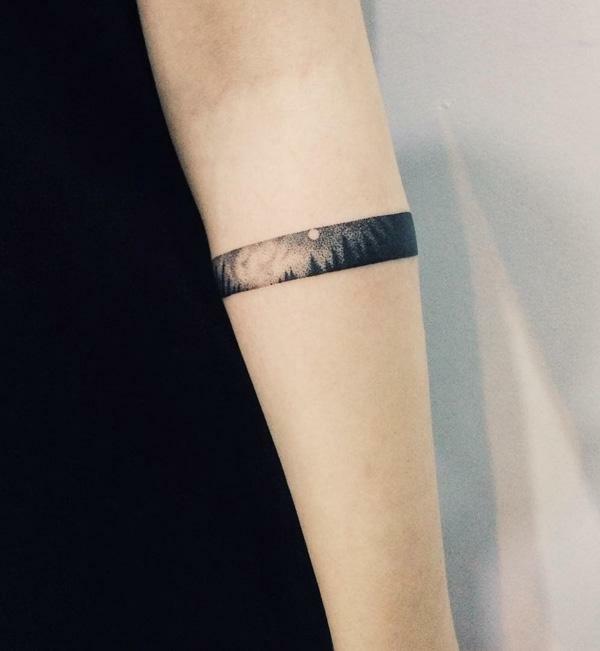 Here, it’s placed in the wrist area. However it’s smaller compared to other designs. 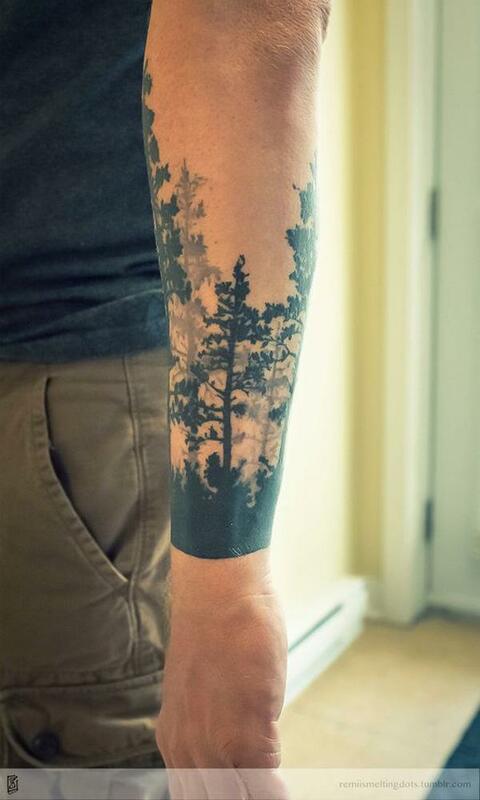 But the size doesn’t really lessen the beauty of a forest silhouette. 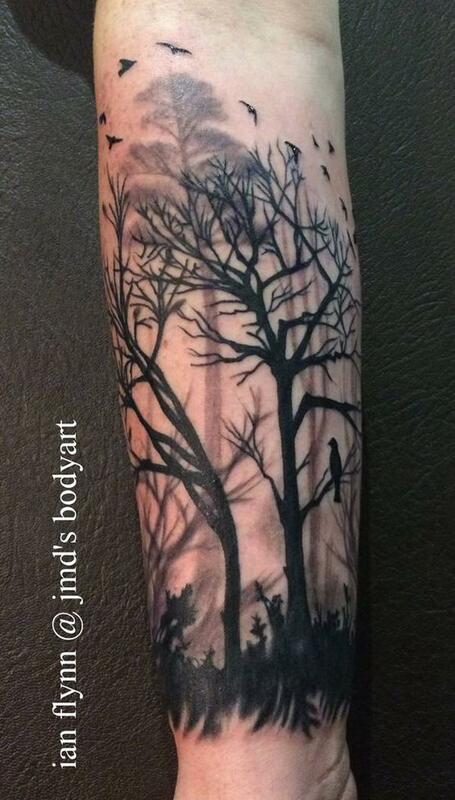 The great thing with silhouettes as your tattoo design is the feeling of mystery. Even when you have a certain message to tell, the design could only give hints and not the entire story. Grow even though the world is tough. Be strong even if the challenges come. 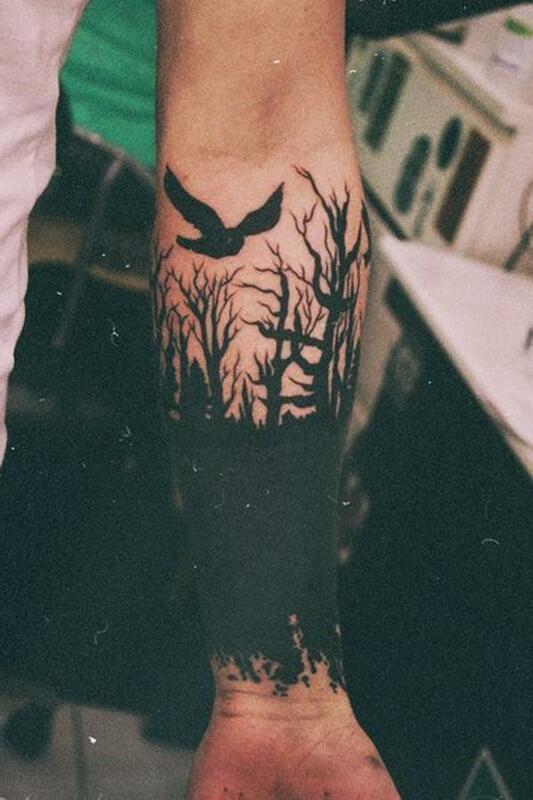 That is what this tattoo could mean. Or again, it could depend on you and what your story is. 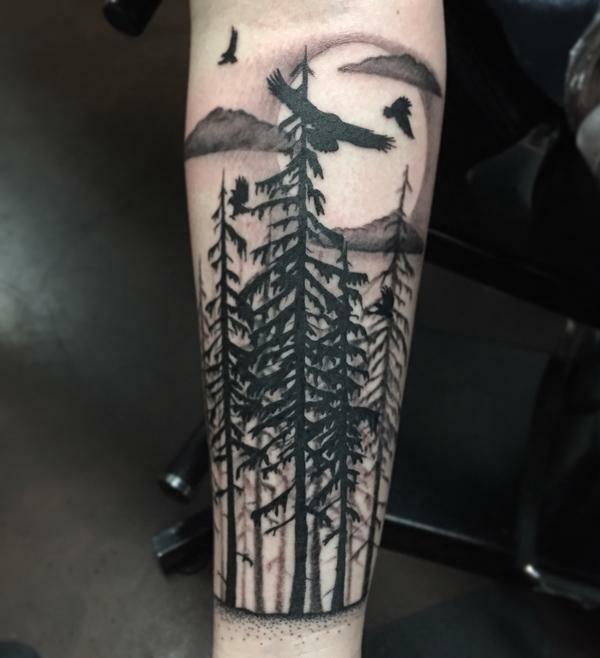 Forest tattoos are usually just silhouettes and are of course, entirely black. But here’s an unusual design with a watercolor styled afternoon sky of pinks and blues. Depending on where you’re from, wolves have different meanings. But usually, it’s a sign of strength and power. 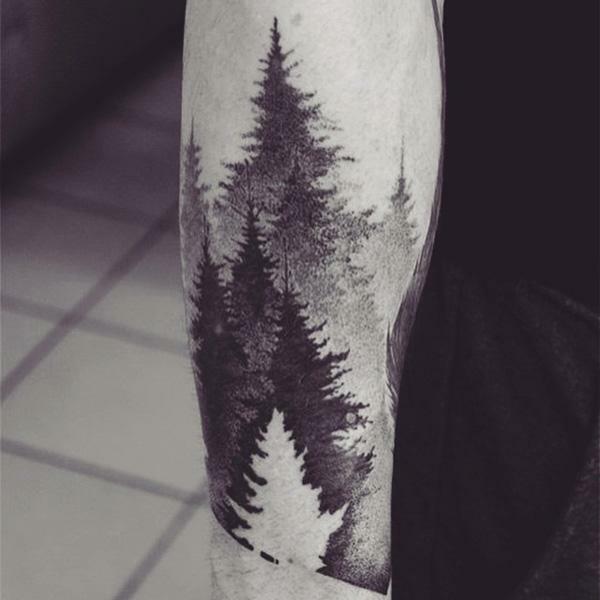 You can definitely add it to your forest theme for a tattoo that doesn’t just give a wonderful message but also a great design. Bears usually call forests as habitat. But that may not be the only reason you need to choose this design. 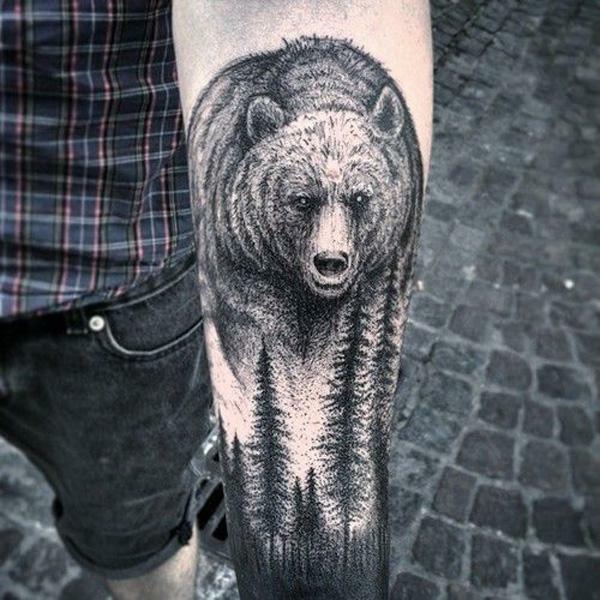 Bears are also symbols for bravery and confidence. 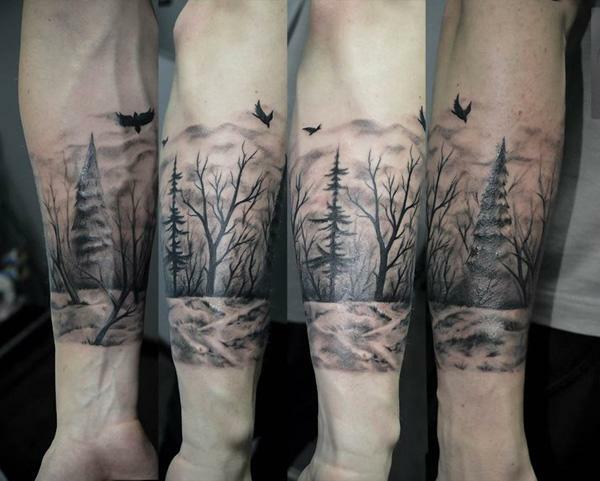 On the technical side, the details on this tattoo and how it is done is truly amazing. The great thing with this design is that it looks calming and that it’s clean to look at. But the details are still there and you still can see a tale unfolding. Flying birds aren’t just for freedom. It some nations, it’s also a symbol for spiritual growth. Since the forest is refreshing, it may not be far from the truth that it could help us grow spiritually by spending some time in the woods. 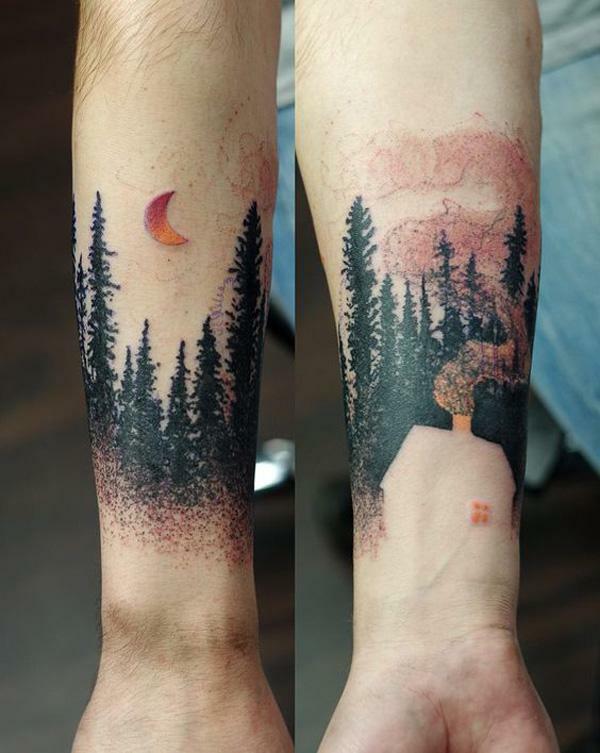 Here’s a surreal and yet mystical tattoo design depicting a night sky, a woman and a forest. A lone tree standing in front of rugged mountains could give you the feeling that you are strong even with the amount of troubles ahead. 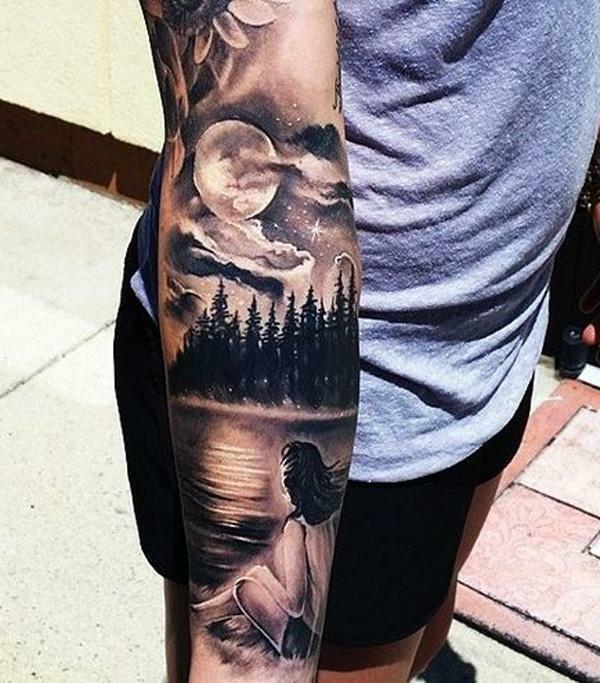 The tattoo of the girl looking up at the sky with the lake and moon, I have to know who the artist was for this piece. Please help me get in contact with this artist.